From the "Bonus Materials" menu, go to the second page and click on "Deleted Scenes". Once in, highlight "Que Sera Sera" twice to highlight a bolt of lightning in the upper right corner of the screen. 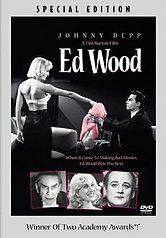 Hit enter to watch a two-minute deleted scene between Ed Wood and Bela Lugosi.